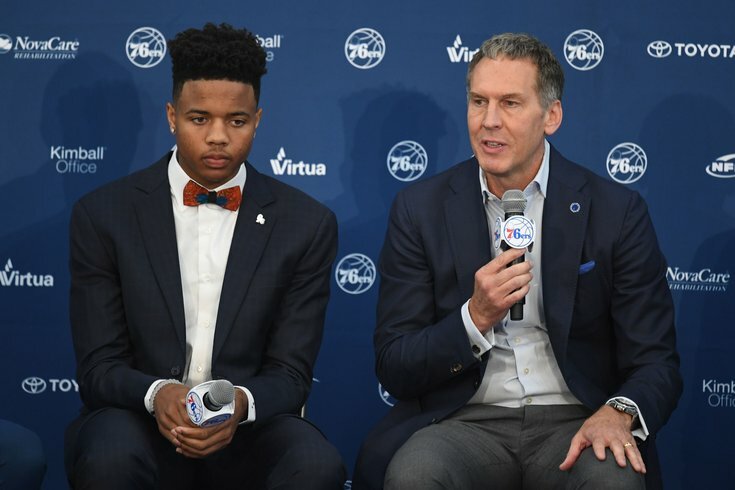 Former Philadelphia 76ers general manager Bryan Colangelo speaks as top-overall pick Markelle Fultz looks on during his introductory press conference. Most of the Philadelphia area is buried in snow, but just like the postal service, PhillyVoice's Sixers mailbag will not be deterred by the elements. It would take a lot more than some measly thundersnow to prevent us from delivering Sixers takes. Even with an imperfect roster and a pair of stars whose youth often gets the better of them, the Sixers are positioned beautifully in both the short- and long-term. They have the talent to scare some more experienced playoff teams in the East, and the flexibility to become the conference's top squad with the right corresponding moves. Whether they end up getting there is up for some debate. And judging by the questions that came in this week, the path forward is still at the forefront of everyone's minds. What's up with #22? Last week we saw him find time with JoJo to good success this week zippy minutes. What is going on with #22. The reason Richaun Holmes isn't getting minutes is simple: he's not good enough on defense as a five to justify playing him. This is a concept I expanded on in a recent piece about his role, and barring a dramatic shift this is not going to change in the future. Holmes has pretty much only been impactful when he has played as a power forward next to Joel Embiid this season. While that's a positive development for him individually, it's really not all that important for the Sixers long-term. They need players who are going to space the floor and offer defensive versatility at the four spot next to Embiid, and though Holmes is a great athlete, he has not proven he can reliably prevail on switches. Even Dario Saric — who has a much better offensive fit and offers a lot more game intelligence — is not the platonic ideal of who you'd play at the four spot in a lineup featuring Embiid and Ben Simmons. Philadelphia hinted at this when they drafted Markelle Fultz, but also when they stuck Saric on the bench to start the year. They want pace and space around their franchise center on both ends of the floor. That Amir Johnson has such a firm grasp of the backup center spot says it all about how the coaching staff views Holmes. They have every reason to invest more time in Holmes playing the five long-term, but they have almost completely abandoned the tactic. Even when Holmes got a rare chance to play center minutes last Friday against Charlotte, Brett Brown bailed on it late in the game and chose to spell Embiid with Ersan Ilyasova in the fourth quarter. The move changed the game and was a firm departure from the minutes Holmes played, in which the Sixers got (predictably) killed on defense. Expectations and pressure have changed for Brown, but he's one of the more developmentally-focused coaches in the league. I don't think anything "happened" with Holmes, but he has a player in Ilyasova who took whatever bit role Holmes might have had as a power forward and eliminated it. Do you think Nerlens would do a better job at backup C this year than Amir, Richaun, Jah? What team do sixers match up with best out of the 7 Other Playoff teams? This answer has to come from a place that is wholly removed from off-court and character concerns. Noel was moved in the first place because he made it quite clear he was not going to be happy here, and that headache was not going to go away no matter what contract he ended up taking in free agency. In that sense, it would have been near impossible for Noel to be valuable enough as a backup center to make up for everything that would come bundled with that. We can also basically throw out Jahlil Okafor and Richaun Holmes in this situation. The former was getting zero burn in Philadelphia and has been one of the worst rotation players in the league in Brooklyn, and we've already discussed the latter's shortcomings as a center. So the argument becomes strictly about Noel vs. Johnson, for me, and I don't think we've seen anything to suggest Noel would be better this year. He has been impactful as a defender in limited minutes lately, with Dallas' defensive efficiency improving by about five points in the minutes he has played since 2018 began. But his full-season On/Off splits are dreadful, and their offense has experienced a bigger plummet than he has made up for with defense. Granted, he plays on a much worse team than Johnson does, but his team's numbers on both ends of the court are worse than Philadelphia's are with Johnson. The Sixers are basically neutral in the minutes Johnson plays, a 102.8/102.9 split between offense and defense during the same timeframe used for Noel above. It's not often pretty and he's not going to offer you a lot of highlights, but Johnson's minutes serve the exact purpose they're supposed to with Embiid on the bench. Would Noel be better here than he has been in Dallas? In a vacuum, absolutely. The Sixers improved by a razor-thin margin (0.1 PTS/100 possessions) with Noel on the court last season, and that was on a Sixers team with much less talent. His rookie year peripherals suggest there is something in there when Noel is motivated. But that last qualifier is part of the problem in Noel hypotheticals. It's impossible to divorce what he's capable of from the real and repeated concerns that have followed him to a second team, where his defensive production is no longer good enough to justify putting up with it. Johnson is a perfectly fine option at backup center, and I would be content to roll with the guy you know and feel is reliable rather than roll the dice on a wild card. Risk-taking has logical limits, and there's not a huge need to press your luck for a 12-15 minute, low-usage backup role. Where would current Fultz go in the upcoming draft? This really depends on who you think "current Fultz" is. He appears to be making progress in the very small windows we get to watch him at practice and before games. But progress represents him moving away from a place where he was basically unplayable, and I think everyone should be in wait-and-see mode until we actually see him on the court. If his shooting problem is anywhere near as bad as it was when we saw him play in October, he's not really a draftable player. A guard with no willingness to shoot beyond 12 feet isn't a fit in the modern NBA, especially when you add on the problems with his free-throws on top of the jumper. Remember, this is a guy whose offensive identity was built around his jumper. His unorthodox handle and playmaking are great to have in the toolbox, but it was his scoring/shooting at all three levels that turned them into real weapons. We saw first-hand what it looked like for Fultz when didn't have his shot in the fall, and his numbers were catastrophically bad. I don't think that's representative of what Fultz's value will eventually be, and he still would have gone fairly high in any draft without being a lights-out shooter. But until we can actually watch him play meaningful minutes again, this is a pretty meaningless exercise. Am I dumb for thinking Fultz will play this year? My wife says yes, my mom says yes, and my dog says yes. Do I think you're dumb? I wouldn't go that far, and I wouldn't use a pejorative like "crazy' either. The one thing I've maintained throughout this process is that speaking with certainty about Fultz is a fool's errand, and I think the smartest approach to take from the outside is to be open to anything. As I detailed in February's extensive report about Fultz, the timelines have shifted both publicly and privately for Fultz. Team staffers insisted they were confident he would be ready to rip by mid-January at the latest during private discussions at the end of 2017, and optimism was in full bloom based on what they were seeing in private. This, of course, followed Fultz working and shooting in private all throughout the process. For reasons explained and unexplained, things didn't work out that way, and frankly, it looked like he had regressed when we finally got to see him practice and shoot in early January. He has climbed back toward respectability over the last few weeks, which is important to consider but also to keep in context. His return to action has been anything but linear, and a few public sessions of positivity are not necessarily representative of whether he can play or help the Sixers. That can only be determined by Fultz's play when he's in the thick of an NBA game. If I had to place my own bet, I'd say he's more likely to sit out than not. Introducing a rookie guard enduring struggles like Fultz into a playoff team's rotation would be complete chaos, regardless of how talented he is and how important he is to their future. That said, it's important to keep his hope for returning this season alive as a form of motivation during a trying time. Embiid has been open about the mental grind he went through trying to return from foot surgeries, and stories circulated at the time questioning his drive and work ethic. People laud those traits in Embiid now, which shows you the size of the mental burden for athletes fighting to return from various ailments. Long story short: I don't think he plays, but your guess is as good as mine. Hope it's not too late to still take questions, but how would you asses the job Colangelo has done so far? I think Colangelo has been mostly fine during his time at the helm of the Sixers. The way he is and will be judged when all is said and done will come down to two factors: how the Fultz situation plays out, and what he does in free agency over the next two summers to supplement Embiid and Simmons. The former looks far more complicated from where we sit at this moment, which seems crazy compared to what many would have believed at the completion of summer league in July. Envisioning a future with Fultz, Simmons, and Embiid leading the way was easy, and there were no foreseeable issues for Fultz on the horizon. There were discussions about future plans at the time, but luring LeBron James seemed like a pipe dream. It's a very different world in March 2018. Fultz hasn't played since October, and the rumors swirling around LeBron suggest it's more likely than ever that he'd consider coming to the Sixers. Those are still uncertainties, so it makes more sense to judge him on the rest of his work. And the rest has been decidedly average. I don't mean that as an insult, but the Sixers haven't exactly thought outside the box in assembling the rest of the roster. Rather than loading up on more "modern" players to lean into Simmons' unique combination of skill set and size, the Sixers have built their roster with time-worn sensibilities in mind. Trevor Booker was a good example of this: he's a perfectly fine and hard-working player, but not the sort of guy who fits what the Sixers are building. On some level, the job is a little more difficult than it might seem on the surface, and we can critique using hindsight. The Sixers were unable to see Simmons play in a real game before they made moves last summer, and watching him in games that matter may have altered their roster approach. They also tried to prioritize wing types to flank Simmons when they drafted him in the first place, but the guys they took either haven't been good enough (Timothe Luwawu-Cabarrot) or healthy enough (Furkan Korkmaz) yet. There are enough small errors (the extra year on Bayless' contract, the Booker trade, not dealing either of Okafor/Noel when better offers were available) to give one pause, and the Fultz trade could end up anywhere on the spectrum from gigantic disaster to huge success, with the pendulum swinging toward the former at present. All told, Colangelo has nailed a slam dunk No. 1 overall pick, acquired a few useful veterans, and ultimately played for the future. Grading him at this moment would be akin to grading a student's essay while they're in the middle of the assignment. If Fultz busts and the Sixers never obtain a true third banana to complement their dynamic duo, history will not smile kindly on him. Most 23 year olds who have put up numbers equivalent or better to Dario’s season have developed into future All-Stars but he’s still discussed as a piece you need to include to get an All-Star. Has a team ever traded a player as young and as good as Dario without regretting it? Saric is floated in trade discussions among fans and analysts because he's less singularly valuable than Simmons and Embiid, and it isn't more complicated than that. I think his improvement as a shooter should prompt real discussion about what his ceiling is, but even the most ardent Saric fan would have to admit he's trailing his running mates in the future star power rankings. I am firmly in the camp of people who think Saric is a "winning player" for reasons that transcend the box score, and I think it'd be silly to trade him for anything less than a sure thing. But if a sure thing emerges from the trade either and fits what Philadelphia is trying to build, Saric is a logical piece in making that happen. Eventually, Saric is going to command some major money when his rookie contract is up, and that's when things start getting dicey for the Sixers. Embiid's monster deal kicks in this summer alongside a raise for Covington, and very quickly cap space starts shrinking as extensions for Simmons and Saric loom. Considering how well he has adapted to playing alongside Simmons and Embiid, the "odd man out" moniker has faded away. I don't think that changes the calculus when it comes to the value of role players overall, and I don't think it should make Saric untouchable, even if he should have a big price tag attached to his name. Given that his idol is Kobe Bryant, Embiid feels like he would insta-lock a DPS character, à la Soldier 76. He strikes me as someone who would want to be self-sustaining, and the health pack portion of 76's kit would allow him to freelance and shoot the hell out of opponents as he pleased. A dark horse pick here would be Roadhog, whose hook ability would fulfill Embiid's natural inclination to troll. Never underestimate how satisfying it is to make other people mad in a video game. It seems the team gets a lot of Redick and Embiid pick & roll possessions (data seems to back this), yet Simmons hasn't been so efficient in P&R sets (lack of gravity?). How do you think the team can increase Embiid's utility as the roll man (especially in the playoffs)? I really think this is as simple as an upgrade in personnel. Every single player the Sixers have to run pick-and-roll plays with Embiid is flawed on some level. Simmons refuses to shoot long jumpers, Redick lacks explosion and plus-handling, McConnell overpasses and gets sagged off, and the rest don't really get much of a chance to try with Embiid. This is why a Fultz-esque player is such a critical addition. Teams don't have to respect any of the team's current ballhandlers at multiple levels and can stop the action with rather simplistic reads and reactions. That equation gets a lot more complicated if a defender is fearful of a pull-up jumper, even if it's a dreaded long two. Before the book was out on Fultz's lack of a jumper, teams shaded lots of attention his way early. Boston crashed heavy on a pick-and-roll involving he and Johnson during the preseason, and he used their collapse to find a wide-open Saric at the top of the key. The idea behind a basic pick-and-roll is to create a mismatch for either of the two guys in the play, but you have to view it through the lens of the whole team, too. If sending Embiid on a rim run and a ballhandler around the screen frees up wide-open threes for Philadelphia shooters, that's a win for the offense even if Embiid isn't benefitting from the play in his box score. Ideally, you won't even need to run a lot of pick-and-rolls with Embiid and Fultz. In the absence of a jumper, Fultz still proved he could bother defenses with his dribbling, and Embiid will learn to make smart, yet subtle movements away from Fultz to get easy buckets. Some of Embiid's improvement on this front will have to come from desire. I think there is a big part of him that feels it is his job to bang on the block and impose his will, which is a great trait to have for a player built like he is. You want him to retain that mindset while also being more willing to set meaningful screens and explode out of a standstill. He has done an excellent job of freeing up JJ Redick when he's curling around the big man, but his pick-setting has been hit or miss elsewhere. I've rewatched some of the early-season games recently, and I get a sense that the Sixers will lean less on motion to create shot opportunities if they feel they have players capable of creating out of freelance/isolation situations. If the Sixers can make Embiid's shot-creation burden smaller through internal improvement and the return of Fultz, it will represent a major gain for the franchise.